• Do not keep a phone turned on next to your body all day, but if you must, face the front of the phone (the keypad) toward your body, as the antennas are at the back. When you are not using the phone, if it is on, stow it in a backpack, purse, or bag. If you keep it on your waist, turn it off. Do not keep a wireless headset turned on in your ear or in your pocket when not in use. • Whenever possible, only use your phone when the signal quality is good. The weaker the signal, the more the radio frequency has to boost itself to get connected, increasing your exposure. When reception is weak (such as in a rural areas) or when you are in a metal box, such as an elevator, train, or car, use your phone only for emergencies, unless the vehicle has a built-in external antenna to which the phone connects. • Text more often and when doing so hold the phone away from your body in your hands or on some kind of barrier, a book for example, in your lap. Phones typically use less radiation to send text than to speak, and texting keeps radiation from your head. • Put it on speaker. Your exposure drops more than exponentially as you move the phone away from your head. Note you don’t have to keep the phone very far away to reduce your exposure by a thousand or even ten thousand times. Even when using the speaker, hold the phone away from your torso when you are talking and be sure that the back of the phone is not close to others, especially nursing infants or other children. • Teach your children to text instead of calling with their phones and tell them not to keep phones on when in their pockets. Tweens and teens and the rest of us should not sleep with cell phones on under pillows or next to the bed all night. • Pregnant women should keep their cell phone away from their abdomen. New mothers should also protect their babies from the phone. Do not speak on the phone or text while holding the device near the abdomen or the baby’s head and do not point the back of the phone where the antennas are located toward a child. A fetus’s or baby’s developing brain is most susceptible to radiation. • Men, especially those trying to become fathers, should also keep their cell phones turned off when in their pockets. 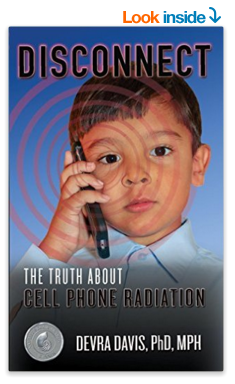 • Be wary of radiation shields and other such protective devices that are claimed to limit exposure to radiation. They may reduce the connection quality and therefore force the phone to transmit at a higher output power. • Avoid using a phone or texting while driving. It’s like driving drunk. Posted in Dirty electricity, Electromagnetic Radiation, Electrosensitivity, Feng shui books reviews.